August Rush. Yes, this movie and Raphsody reminds me of August 2016. Escaping from the comfort zone, being far away from what you call as "Home". It happens fast, it's August Rush. While the time flies, changing your colorful life. This poem, it pop like a popcorn. Inspired by the movie of August Rush. I recommend you readers to watch this movie. And feel the sensation of struggling outside the comfort zone, while you are what you do, and you are what you have to struggle. 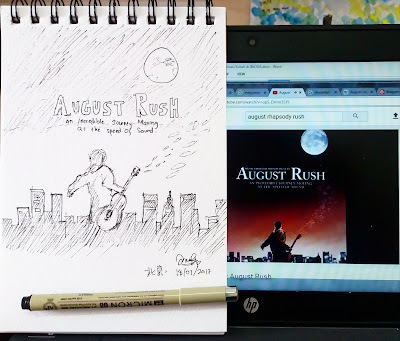 Beside that, I love this August Rush Movie because it has a heart touching story of how August struggle the world with his talent. Till the end the symphony of "August Rhapsody". An amazing set of instrumental symphony created by a natural and genius composer, August Rush. "Music is all around us, all you have to do, is listen. "- August Rush. Haidian, Beijing, 18th of January 2017.